The acquisition of the Indian oil refining company Essar Oil by Rosneft and partners will be the largest ever foreign direct investment in India. The $13 billion dollar deal is also Russia’s largest investment abroad. The prized asset that Rosneft consortium gets out of the deal is the Vadinar refinery in the western region of Gujarat that can process 400,000 barrels of crude oil per day. Control over the second largest refinery in India will give the world’s largest listed oil producer a solid foothold in the fast-growing Indian market, as well as an outlet to energy-hungry South Asia. Other assets that are part of the deal include 2,700 petrol stations, a deep-water port at Vadinar, and power plant that provides electricity for the Vadinar refinery. The Vadinar refinery was initially planned to open in 1996, but a variety of delays pushed back the open until 2008. The plant itself is modern and has the capacity to refine heavy and extra heavy crude oils. About 40-50% of finished products will be diesel fuels, 15% gasoline, and another 9-10% petroleum coke, a coal-like and carbon-intensive energy source. The oil flowing into the plant mostly comes from abroad (The Middle East and Latin America), and only about 15-20% is domestically sourced from India. Under the new deal, Rosneft will supply 200,000 barrels of oil per day, or about half of the raw material, over a 10-year period. Rosneft will supply the refinery with pre-paid oil from Venezuela: in August, the Russian oil company lent Venezuelan state oil company PDVSA $6 billion, and the indebted company will pay it back with oil. Crippling debt is also what led to Essar Oil to seek a buyer. Last year, the company was struggling to pay interest loans on time. In 2016, Essar Oil paid off $600 million in interest, which was about half of the company’s EBITDA (profit before depreciation, interest, taxes, and amortization). No dividends were paid out in the last fiscal year. Rosneft itself acquired 49% of the Indian company, and another 49% was acquired by a consortium which includes oil trader Trafigura Group and United Capital Partners (UCP). There is an observation that the consortium companies play a purely ceremonial role, and were included to avoid international sanctions or interference by the US. Had Rosneft bought all the shares outright, then Essar Oil would become a subsidiary company and would be sanctioned. According to a report by The Indian Express, Amsterdam-based Trafigura financed its share of the purchase with a loan from Russian state bank VTB. There is an alleged agreement in which Trafigura will transfer its stake to Rosneft in the future. The Moscow-based United Capital Partners has long been suspected of having special ties with Rosneft management. Head of United Capital Partners Ilya Shcherbovich considered it necessary to public refute these rumors. The total transition amount was officially stated as $12.9 billion, of which $10.9 billion was for the Vadinar refinery asset itself, and another $2 billion for the remaining assets. Rosneft only paid $3.5 billion in cash, and the consortium paid the same amount. VTB will issue Essar a $3.9 billion loan in order to restructure its debt. In total, $10.9 billion was paid to Essar Oil. Essar Oil shareholders received a total of $7 billion. According to the agreement, these shareholders will have to transfer about half of this sum back to Essar Oil to pay back the company’s outstanding accounts payable, including a $2.5 billion debt for Iranian oil deliveries. Another $2 billion will be spent on the acquisition of the Essar Oil Vadinar oil terminal, an asset which was not previously owned by the company. The new buyers will receive the asset shares once the debts of the terminal (which are on Essar Oil’s balance sheet) are offset. According to Indian analysts, the $10.9 valuation estimate was based on a 12.5 multiple of EBITDA. This estimate doesn’t look at the market capitalization of the company because the share value of a highly indebted company would be massively undervalued. Instead, the method gives a value to the enterprise as a whole without taking into account the debt load. For Rosneft and the consortium of buyers, this means that the total return on invested capital was a ratio of 1:12.5, or 8%, and this is before depreciation and taxes. This estimate is approximately twice as large compared to other similar companies to Essar Oil. For example, India’s biggest oil refining company Reliance was estimated to have an EBITDA multiple of 7 at the time of sale. Perhaps this is because there is potential to expand the capacity of the expensive equipment? Unlikely, as at the time of sale, the refinery was (and still is) operating at about 100% capacity. According to data from Essar Oil, only $5.3 billion in the capital was spent on construction. So, for the amount that Rosneft and its partners paid, it would have been possible to build two such refineries from scratch? The price tag is linked to currency volatility. Before Rosneft agreed to buy Essar Oil, it was a condition that the company delist from the Indian stock exchange at the end of 2015. Before that, in June 2015, the company stock was worth about 100 Indian rupees per share. In mid-June 2015, after the announcement of a deal with Rosneft, the stock price jumped to 146 rupees per share. By December 2015, Essar Oil was forced to offer minor shareholders a buyout price of 262.8 rupees per share. The Indian government stipulated that Essar Oil had to offer minority shareholders the same share buyout prices it was planning to sell to Rosneft. The all ubiquitous VTB happened to provide money to Essar to buy out minority shareholders. Therefore, Rosneft paid about 2.6 times more than market value before the acquisition was announced. How much is this in monetary terms? The market capitalization of Essar Oil (the cost of shares, ie the company’s value minus debts) in June 2015 prior to the announcement of the Rosneft deal was about 140 billion rupees, or about $2.2 billion. And Rosneft paid $7 billion for company shares. That leaves a $4.8 billion gap in transaction price and market capitalization. Even if Rosneft was willing to overpay for access and control, certainly the company cannot justify such a massive discrepancy in value. Some news outlets reported that Saudi and Iranian oil companies initially showed interest in purchasing Essar Oil. This is doubtful – neither Saudi Aramco nor NIOC have ever made major investments abroad, nor do they have the cash. Let us not forget that this deal carries significant political weight. It was signed at a meeting between Russian President Putin and Indian Prime Minister Modi at the BRICS summit. One would think that before completing an acquisition, it would be worthwhile to carefully study what you are getting into. 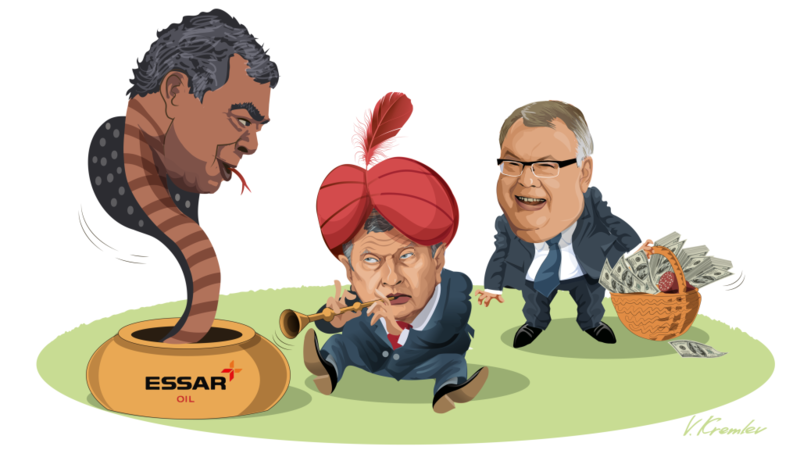 However, Essar Oil released its latest report for the 2016/2017 year on August 19, 2017, that is, almost the same day that the deal with Rosneft was finally sealed. Apparently, the Russians were in a hurry and did not want to examine the company’s financial position in detail. It is possible Rosneft conducted its due diligence in conjunction with the audit before the company closed its books, although this would be a highly unusual practice. Before completing the acquisition, one would think it would be worthwhile to study in detail what exactly you are getting. But, apparently, the Russians were in a hurry and did not want to examine in detail the financial position of the company before finally acquiring it. Perhaps, however, that they conducted due diligence simultaneously with the audit, before the closure of the company’s books – although this would be rather unusual. Another oddity is that the final report was produced according to Indian Accounting Standards, unlike previous years, when reports were done according to International Financial Reporting Standards. This is in no way illegal, but it is rather unusual and suspicious conduct right before a sale. Essar Oil took made another extremely unorthodox move during this period and switched external auditors from Deloitte to an unknown Indian auditor to certify the financial statements. The last audit carried out by Deloitte was published with “qualification”, which doesn’t fully confirm the reliability of the company’s financial statement. In the two years between the announcement of the sale and the final acquisition, Essar Oil showed significant improvement in its financial performance. For the 2014-2015 fiscal year, EBITDA totaled $900 million, and the next year it reached $1.1 billion, and in 2016-2017, it was already $1.7 billion. In two years’ time, the company’s profitability doubled, yet there were no significant developments in capacity or utilization. Ahead of a sale, companies engage in “window dressing”, improving the appearance of a company before putting the enterprise up for sale. An example of such a number trick is an increase of activity in an affiliated company, Essar Energy Overseas Limited, which in 2016 shipped about $2.5 billion worth of products. Deloitte declined to recognize the debts as high-quality. We don’t know for sure if Essar Oil engaged in such methods, but if they did and it slipped under Rosneft’s radar, that’s another issue. Who Exactly is the Seller? Essar Oil is part of the Essar Group conglomerate, which is owned by the famous Ruia family in India. Originally from rural western India, the family began their business in construction and built a large business empire over the past few decades. In addition to oil, the family has interests in telecoms, banking, and metals. In 1999, Essar Steel became the first company in the history of India to default on its international debt. More recently, the telecoms arm of the conglomerate has come under legal scrutiny over charges of fraud and bribery to government members to secure 2G services. The slump in commodities caused significant problems in their metals enterprises, and Essar Group debts reached 1.4 trillion rupees, or about $22 billion. Selling Essar Oil was the only way for the Ruia family to manage this heavy debt burden. The deal was a relief for both the Ruia family and many of Essar Oil’s creditors. Standard Chartered Bank, according to estimates, was able to recover $2.5 of the $5.5 billion that it provided to Essar Group. Rosneft officially only bought 49% of the shares, which means that Indian company’s activities will not be added to its balance sheet. This means that Essar Oil’s debt will not be added to Rosneft’s already heavy corporate debt situation. At the end of the second quarter, Rosneft’s had a lot of cash on hand, $12.4 billion to be exact. This cash flow is pre-payments from the Chinese for oil supplies, in a deal struck several years ago. Rosneft paid $3.5 billion in cash for its stake in Essar Oil. Given its cash reserves, this is of course more than feasible, but the indicators of net debt (debt minus cash) will increase by the same amount. India is a very promising market with an ever-growing population and increasing purchasing power among the middle class. India is the third biggest oil buyer worldwide, after the US and China, and produces oil that covers 20% of its total oil demand. Perhaps Rosneft made the right decision to invest in India and secure a foothold in the market, which will become one of the most significant in the world. At the same time, working in India presents its own set of challenge. Indians are tough business partners, and it is extremely important to understand local conditions and markets, especially in downstream products. The dynamic and sales-oriented approach is much more unique than developing upstream fields abroad. How does the acquisition of an Indian oil refinery fit into the development Rosneft’s strategy? Is this a purely financial investment aimed at dividends, or should this new acquisition help the Russian company achieve some strategic goals? Many believe the transaction was not of commercial interest but was a geopolitical move to build strong economic ties with India. In 2016, Rosneft offered India’s state Oil and Natural Gas Corporation will increase its stake in Rosneft’s Vankor project to 26 percent, and a group of Indian companies (Oil India, Bharat Petroresources, and Indian Oil) to increase their stake in the Siberian field Vankor to 49.9% for about $3.1 billion. However, it is rather useless to link these transactions: besides the fact they both contain the word “Indian”, they have nothing in common. Another motivation for the deal could be Rosneft’s scheme to move 200,000 barrels of Venezuelan oil to India per day. Of course one of the main risks is that everything in Venezuela is hanging by a thread – if the Madura government falls, Rosneft could lose its source of oil for the refinery. Between the purchase of the refinery and the prepayments to Venezuela, Rosneft has spent about $17 billion. That is a very expensive risk. In any case, it’s hard not to agree that the purchase of Essar Oil was truly a landmark deal. But only time will tell if this acquisition turns out to be profitable.